This emergency water packet provides chilled drinking water to soldiers, fire fighters, athletes, hikers, cyclists, campers, scouts, Red Cross, families on road trips, and commuters stuck in traffic. It's also perfect for the earthquake kit. The HinesLab water packet uses evaporative cooling to chill the water before opening. The hotter and dryer the climate, the more effective the cooling. Drinkable water is sealed in the inner pouch which is conntected by a string to the outer packet. The outer surface of the hanging water pouch is damp so that evaporative cooling takes place when spun on the string. Moisture in the covering (like a thin sponge or paper towel) on the water pouch evaporates to provide evaporative cooling. The water pouch is spun about 20 times, to speed up evaporation to increasing cooling. After the inner packet has been cooled by evaporation, it is torn open for drinking. 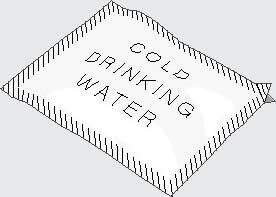 Water packets are made using continuous material handling for high volume production. Water-proof heat-sealable plastic film is laminated to pressure-sensitive adhesive-backed water-absorbent fabric tape (ex. : 3M #1776) which can be pre-printed with product name and instructions. 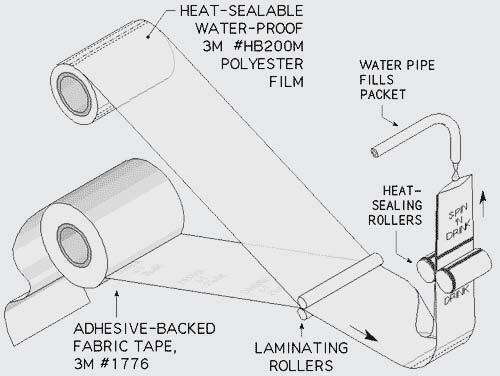 After lamination through rollers, the material is folded over before going through heat-sealing rollers to form a pouch that is water tight on the bottom and sides. The pouch is filled with clean water before being sealed at the top, trapping one end of the string. The inner packet is then separated and moistened (in a later operation). The inner packet from the diagram above, with its attached string, is then sealed in an outer pouch made of the same water-proof film (3M Scotchpak™ HB200M polyester) which has been pre-printed with product graphics. In this sealing operation, the free end of the string is trapped in one edge of the outer packet which will serve as a handle when spinning the inner packet to cool the potable water.